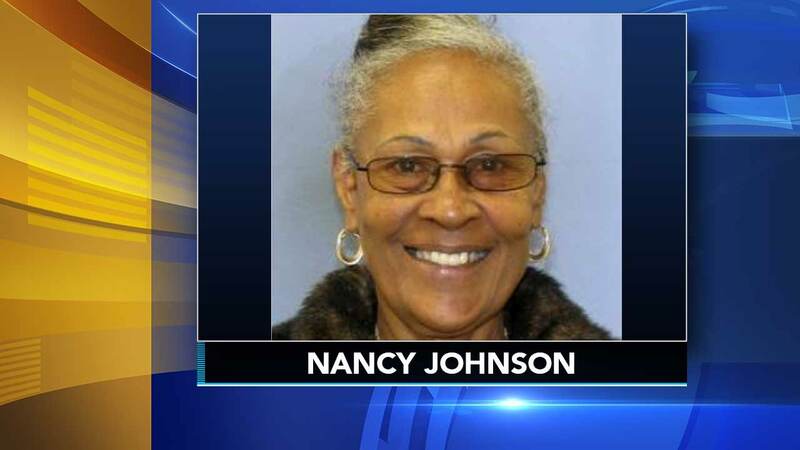 PHILADELPHIA (WPVI) -- UPDATE: Authorities report that Nancy Johnson has been located and is in good health. The Philadelphia Police Department is asking the public's help in locating a missing 73-year-old woman who was diagnosed with dementia. Police say Nancy Johnson was last seen on the 8500 block of Temple Road at 5:20 p.m. Saturday. Johnson is described as 5'6 and 116 pounds. She was last seen wearing a black jacket, green shirt, blue jeans, black Reebok sneakers and a black pocketbook. Police say she is known to frequent the areas of 1700 North 25th Street and the 2400 block of Chadwick. Anyone with information should contact Northwest Detectives at 215-686-3353 or call 911.